Transcontinental solidarity between people, nations, civil society and public institutions stood at the beginning of the Fundación Pueblo and remains one of its essential elements. We understand international solidarity not only as a way to do good, where needy people from one end of the world can receive the help from people at the other end of the world, as our friends, supporters as individuals, groups and organisations do. The interest of one for the needs of another and the willingness to help above all seems to us a value in itself. The wide range of partnerships in which the Fundación Pueblo partakes, are a testimony to this living international solidarity. An example of this international solidarity is Florence Brenzikofer. 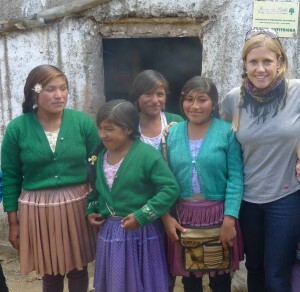 She has moved with her entire family to Bolivia for two years, to support Fundación Pueblo’s “Student Boarding in Guest Families” through teacher training. Looking back, she concludes: “My work in Northern Potosí has always been a combination of giving and receiving: On the one hand, I could share my teaching techniques and methods with local teachers and staff of the Student Boarding in Guest Families; on the other hand, Bolivia has given me a bag full of insights and experience to take back to my native Switzerland.” Years after returning to Switzerland, Florence could re-visit her projects in Northern Potosí in 2014 (see the picture) – all of hem still working, now fully managed and funded by local county governments.